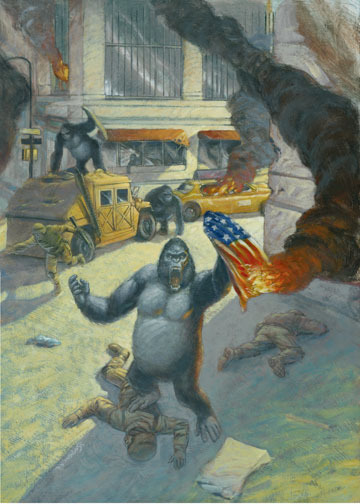 Ty Templeton on the Planet of the Apes | Ty Templeton's ART LAND!! ← A New Year, New Classes! I’ve got piles stuff on the drawing board to work on, and OH, so little time to play Art-Land this week – but I cannot let this moment go un-blogged! 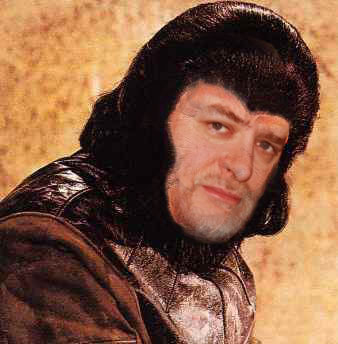 I’ve been made into a character in the Planet of the Apes. Look! It's like photoshop, only crappy! Good morning, Ty. The world is filled with armed gorillas, and perhaps, a half-naked girlfriend. After that, I could go deal with school. I was lucky enough to work on an Apes comic a few years back – writing/editing a six issue mini series called Revolution on the Planet of the Apes. The original, unseen cover for Revolution #1, rejected because Fox didn't want a burning American flag anywhere near their properties and logos in 2007. Painted by Dennis Rodier. It’s an exhaustive and very entertaining encyclopedia of EVERY character, location, institution, and scroll ever mentioned in a movie, comic, novel, or back of a toy box. Apes fans must own it. 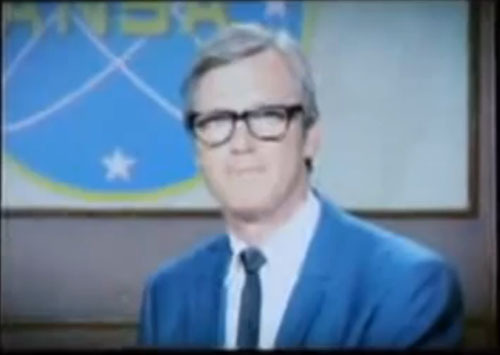 Apparently , Templeton is the name of the narrator of the ANSA Space Program promotional film included in the recent Blu-Ray versions of the original movie. It’s a DVD extra, and a minor one at that, but the character shares my name. How cute. BUT WAIT…! He’s going to be in an upcoming Planet of the Apes novel, and his name isn’t a co-incidence. He’s named after me! Now, I know, this is a teeny nothing of a throwaway character, not even a trivia question in the Apes World – but if I could go back in time to the the thirteen year old kid who woke up every morning to a Planet of the Apes poster and told him that one day he’d be a teeny nothing throwaway character in that world, he’d have fallen over dead. If you at all care, you can see the ANSA film here on Youtube. Sometimes, it all works out in this grown up fanboy’s life. Why was this my favorite Kirby comic ever? This entry was posted in Planet of the Apes, Ty Templeton and tagged planet of the apes, POTA, Revolution on the Planet of the Apes, Rich Handley. Bookmark the permalink. 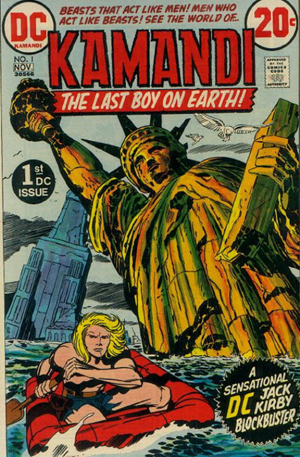 Kamandi #1 was your favourite comic because of the statue of liberty on the front cover looks almost exactly the same as the one at the end of the original Planet of the Apes, now get your hands of me you damn dirty ape!!! That is, in fact, correct! What do we have for our contestant? What…? Nothing? That hardly seems fair. Seeing this brought a smile to my face. Thanks so much for posting it. 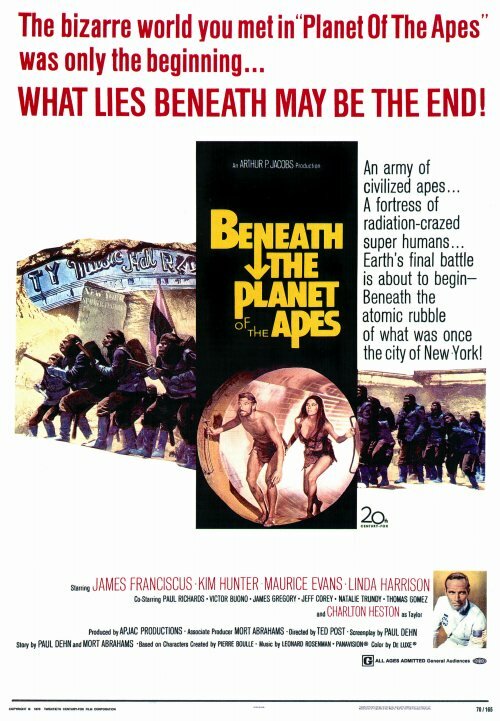 You were extremely helpful to me in providing background information while I compiled both the lexicon and, before it, the POTA timeline book, so when I began editing Conspiracy of the Planet of the Apes for BLAM! Ventures (I’ve since become the novel’s co-author, with Drew Gaska), and the opportunity to name the character from the ANSA film came up, I thought it would be fun to give him your name. For my money, Revolution remains one of the best Apes comics to date, right up there with Marvel’s “Evolution’s Nightmare” and “Quest for the Planet of the Apes,” and Malibu’s “Sins of the Father,” “Quitting Time” and “Urchak’s Folly.” So the honor of giving Templeton your name is all mine. A definite honour, but they should have just gotten YOU to do the narration instead of some guy who looks suspiciously like tower sniper Charles Whitman. It is great to see you in full costume and make-up as a simian resident of the Planet of the Apes. It is also very cool that your change is complete with nothing more than the hair on your head; no actual make-up on the face required. Re: the photo of you in POTA costume; as a confirmed winter-hater, it occurs to me that you may have a lucrative idea there for the definitive seasonal hat, one which keeps the ears and neck warm. This could be for you what liquid paper was for Mike Nesmith’s mom! Hmmm…I see only one problem – after I kill Rick Baker (creator of the costume design) and convince 20th Century Fox that I was marketing their intellectual property without permission, then my only hurdle would be to convince the public of the greatness of a moribund SF franchise from the 70s. GENIUS! I think hoodies cover this without all the murder and thieving. But all ideas are welcome.